This species was formerly known and distributed under the holding name S. sp. "Pancas". The official name was published in 2019. 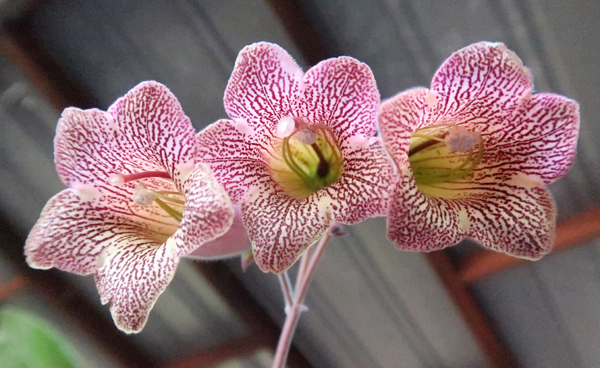 This new species has intriguing spotted flowers, resembling some in the genus Stapelia (family Apocynaceae). The composite photo at the right, supplied by Alain Chautems, shows some features of the plant. 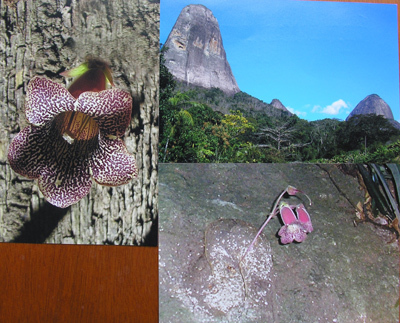 The upper left picture shows the flower, with probably the most spotting of any Sinningia species. Its only real competitor is Sinningia guttata. The lower right shows the inflorescence borne directly from the tuber, when the plant is leafless. In this it resembles Sinningia defoliata. The tuber appears to be imbedded in a rock crevice. The upper right shows the habitat of this plant. It grows on an inselberg, literally "island mountain" in German, referring to a large rocky protuberance jutting above the surrounding terrain. Presumably, possession of a tuber enables the plant to survive in this inhospitable-looking environment. I sowed the seed of this species in August 2010. 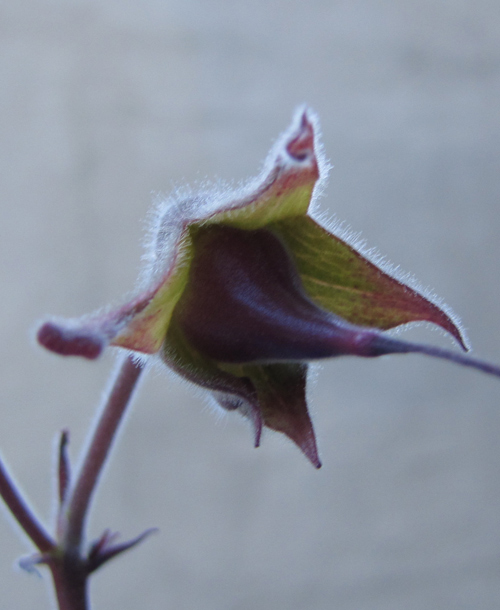 In November 2014, I saw the first flowerbuds. This picture shows the tuber in December 2014. 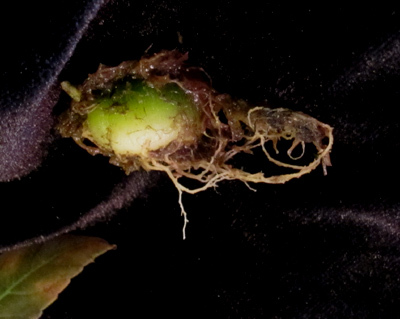 In addition to the developing flowerbuds, one can see the shoot buds scattered along the surface of the tuber. This strongly resembles the appearance of the Sinningia helioana tuber. This provides one piece of evidence that the two species are closely related. The flowers of both species are held almost vertically. In nature, as suggested by Alain Chautems's picture above, the tuber may grow at an angle, with the flowers pointing downslope. Unfortunately, the first corolla dropped without ever opening. The second dropped almost as soon as it opened. I set the base of the corolla in a pan of water, in hopes that the pollen would ripen. The corolla opened further, and lasted a couple of weeks. 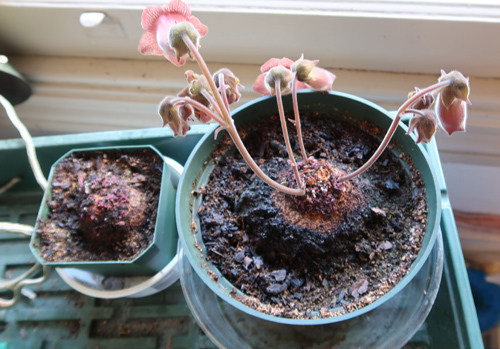 The plant had two more buds, however, and both of them opened without dropping. These corollas are about 6 cm [2.3 inches] long and almost 5 cm [2 inches] across the face. 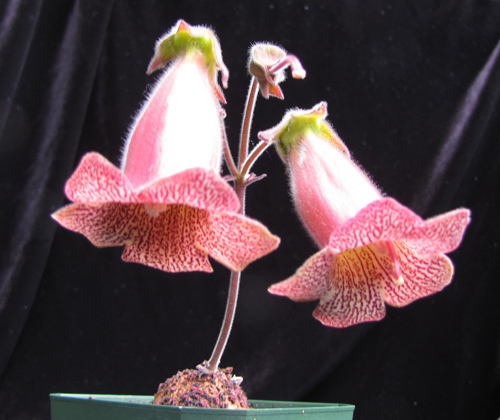 This species has the standard gesneriad pair-flowered cyme. The first flower on this cyme is represented by the style at the top. This is the remnant of the flower that opened and immediately dropped. The flower on the right is the pair flower, positioned right under the first flower. The flower on the left is the first cyme side-branch flower (and the only one on this inflorescence). 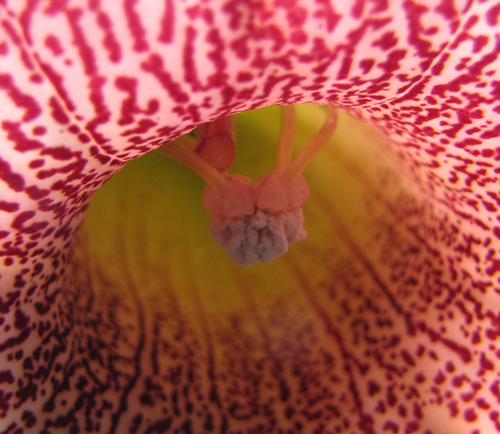 This picture shows a close-up of the contorted anthers. The corolla's heavy striping and speckling, and its sturdy texture suggest that this species might be bat pollinated. 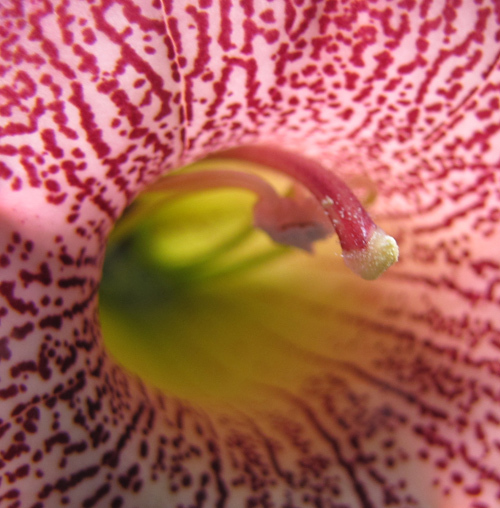 This picture shows a close-up of the stigma, already dusted with pollen. The flower is in its second, "female" phase. This species has a fat red fruit. Length of this fruit is 2 cm. 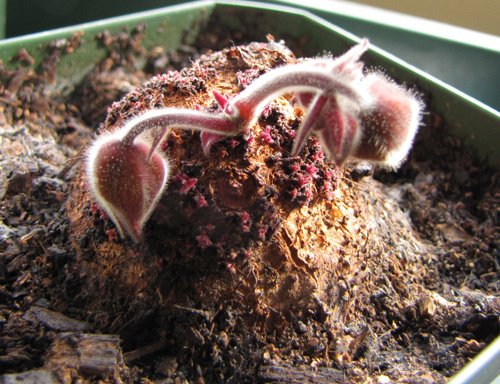 This picture shows some seedlings of Sinningia stapelioides in a 3.5-inch pot. Note the light-colored midrib and herringbone side ribs, which are very reminiscent of Sinningia reitzii. The latter species usually loses this highlighted rib coloration as it ages, and so, apparently, does this species, as we will see below. There are two horticultural issues to note. First is the moss growing on the surface of the soil. I rarely get moss in my pots, but all pots of this species have it. The other thing to notice is the plastic bag. I have been growing seedlings enclosed since the first few transplants, grown in the open, died. The bag is not one of the zipper types. 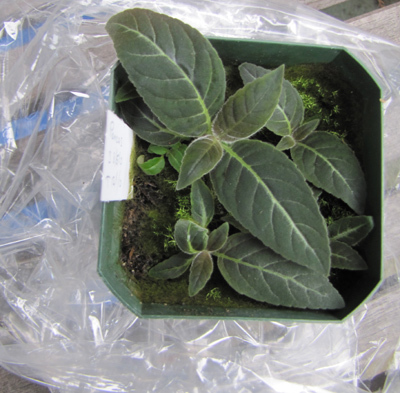 I have another pot growing in a zipper bag, and those seedlings are quite a bit smaller, perhaps because the greater thickness of the plastic blocks too much light. Seed for these plants was sown in August 2010, and this picture was taken six months later in February 2011. 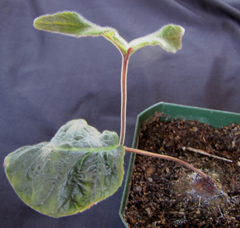 This picture shows a single-stem seedling. This plant still looks like it could be Sinningia reitzii. Seed sown 5 August 2010. Picture taken 6 June 2011. This plant has multiple stems but otherwise resembles the one above. Seed sown 10 February 2010. This plant has ceased to resemble Sinningia reitzii, and now reminds us of Sinningia helioana. A single leaf is borne at the top of a stem which looks like a petiole. Note the moss around the base of the stem, and the new shoot with normal sinningia growth habit. This unusual form combines the ones above. 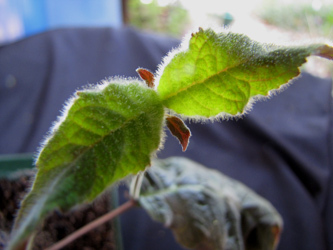 It has a normal shoot growing out of the node at the top of a "unifoliate", helioana-like shoot. See the picture at the right for the whole plant. Seed sown 22 February 2010. As the plants aged another year, the plants obviously acquired the same pattern: one leaf on a petiole-like stem. The differences in size are probably due to culture. The plant at the far right was growing outdoors. None of the plants bloomed until one did near the end of 2014. Sinningia stapelioides leaves last a long time (years) when dried, without any special arrangements at all (no press, no desiccant), See here for a picture. 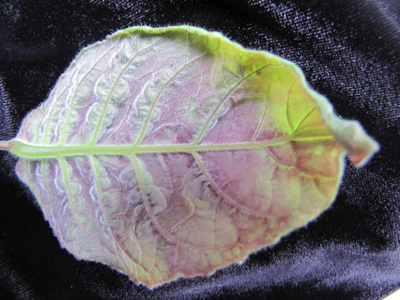 Here we can see the back of the leaf, with a tinge of maroon, contrasting with the puckers of green along the ribs. The younger seedlings in the picture above have solid maroon leafbacks, another characteristic shared with S. reitzii. The ball-shaped tuber of this species is often green, even in areas not exposed to light. Small tubers (less than 1 cm in diameter) are green spheres. Note that most of the roots on this tuber sprout from the top, rather than the underside. 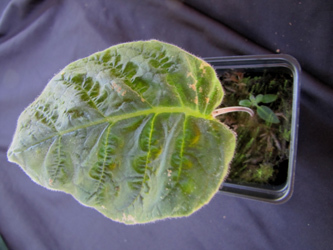 As in the case of S. helioana, we can discover that what appears to be a petiole is actually a stem. This is shown by the dried leaf stub just below the blade of the main leaf. 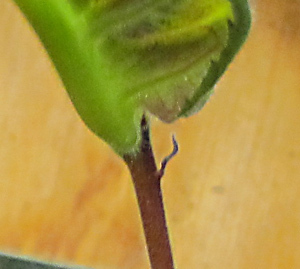 From the surface of the stalk, one cannot see where the boundary between the stem and the petiole is, but the presence of the leaf stub almost certainly indicates that all the "stalk" tissue above it is actually petiole and the tissue below it is stem. This stem, with two leaves, is clearly not a petiole. 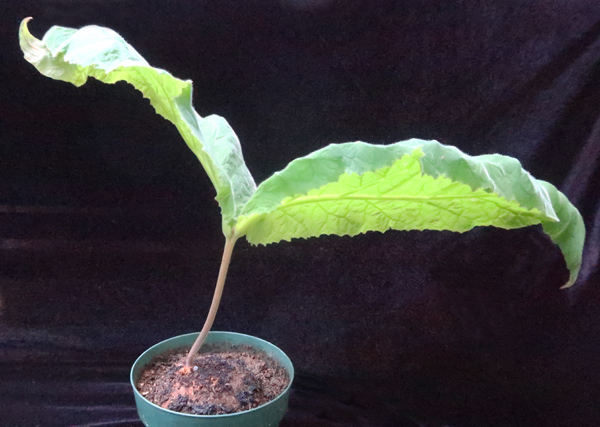 Here, the larger of the two leaves is about 32 cm [12.5 in] long. Pot diameter is 5 inches [12.5 cm]. This plant is grown outdoors, in full shade (so far). It has not bloomed (as of 2018, when this picture was taken). 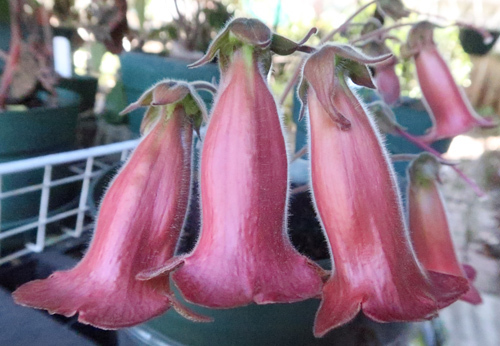 It has been difficult to get Sinningia stapelioides to bloom. First, its natural blooming period is mid-winter, not an easy time of year to manage, especially in cold-winter climates. Second, it appears to be very tied to short days, so that artificial light can interfere with the natural signals to stimulate blooming. Grow the plant in natural light, if possible. The bigger the pot, the better. Lots of water. Keep it wet. Maybe when the leaf drops, withhold fertilizer. Drainage isn't important. The soil these plants are growing in [winter 2017-2018] is quite dense. 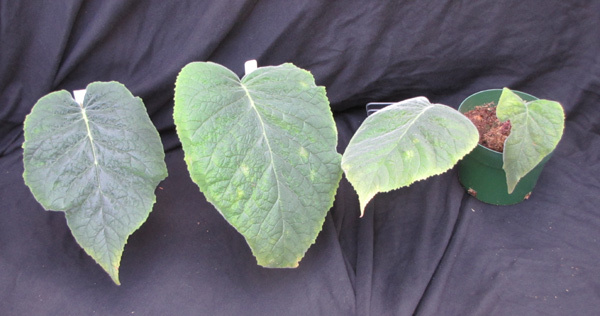 The photograph at the right shows two plants with roughly equal-sized tubers, growing in the same window, and thus receiving the same light and water. The plant in the bigger pot is blooming, the other is not. Because the flowers hang almost vertically downward, it can be difficult to photograph the face of the corolla or its interior. The best way to get a good picture is to find a high perch (eye level or higher) with a more or less neutral background and photograph upward. That is how the photograph at the top of this page was taken. The photograph on right shows the same plant a minute later, in the same location, photographed on the level. Growth Indeterminate as juvenile, determinate when older. Habit When juvenile, low herb with compressed stems. When older, one leaf on stalk. 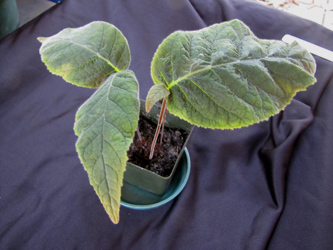 Leaves Patterned when young. Backs solid maroon when young, mottled maroon or plain green when older. Dormancy Plant has a tuber. Strictly speaking, my plants do not have a dormant period unless they do not bloom. Blooming (or not blooming) alternates with vegetative growth. Inflorescence axillary cyme growing directly from tuber. Season Winter. It may require short days to bloom. Flower Spotted; see pictures at top of page. 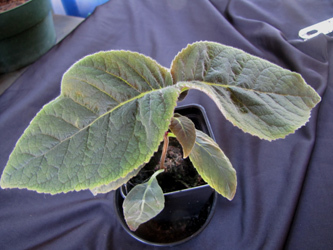 Hardiness So far, a seedling has survived 32 F [0 C] nights outdoors. Given where it was found, I expect it to be relatively tolerant of cold. The outdoor plants have not bloomed, however. Culture Appears to appreciate high humidity. Seedlings grow very slowly. Seed to bloom For me, it took four years. And that was only one of my plants. Taxonomic group Apparently in the aghensis group of the Corytholoma clade. Its closest relative is probably Sinningia helioana.